U.S. Fish & Wildlife Service's Katrina Marklevits treats Key deer with anti-parasitic medicine to protect them from screwworm. U.S. Fish & Wildlife Service biologists are also treating uninfected Key deer with anti-parasitic medicine, as well as treating minor wounds in deer. But they’ve also started to work on Plan B – a 35-acre enclosure that could serve as a kind of Noah’s Ark to make sure some deer are saved. "It's going to be used if the population shrinks below a size suitable for survival," said Kevin Lowry, chief public information officer of the National Key Deer Refuge. Biologists and vets have not yet determined what that population size would be, Lowry said. Before the screwworm infestation, the herd was estimated at 800 to 1,000 animals. More than 120 have died so far from the parasite. Screwworm flies lay their eggs in open wounds on warm-blooded animals. 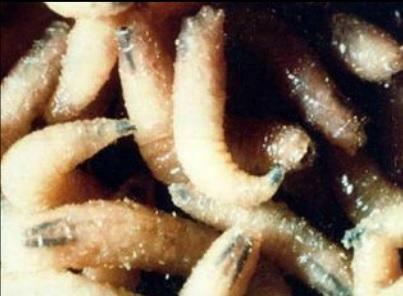 When the fly larvae hatch, they feed on the living flesh of the host. The wounds get larger and often infected, killing the host. The USDA has started releasing sterile screwworm flies in the Keys twice a week. That's the proven method that had eradicated screwworm from the U.S. The enclosure is on refuge land, in an area where the deer roam anyway. The gates will be left open until biologists decide the situation is critical. "It's just a precaution we're taking," Lowry said, "and we hope we never have to use it." Another enclosure is being built on nearby Cudjoe Key, where a separate part of the deer herd lives.